"I made a decision as a man, and as a man over there, Max Kellerman, just respect it and leave it alone." 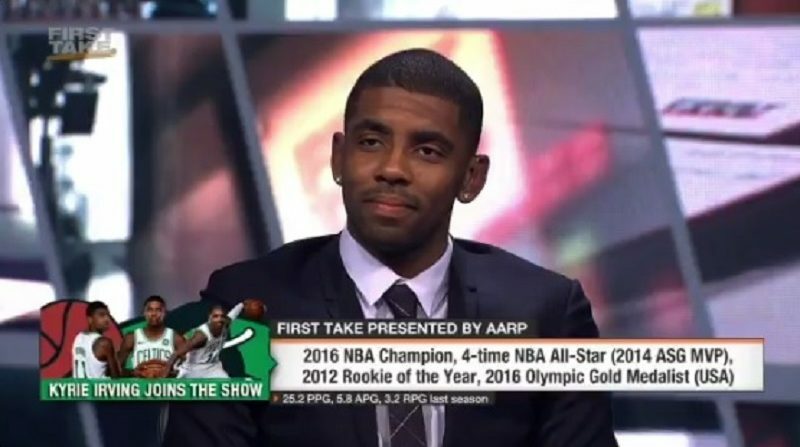 For once, the weirdest things said on ESPN’s First Take didn’t come from Stephen A. Smith or Max Kellerman. Instead, it was new Boston Celtic Kyrie Irving making headlines Monday with an odd appearance that saw him make a bunch of seemingly-nonsensical comments, further his feud with LeBron James, troll Kellerman repeatedly and dodge numerous questions. And that was just part of Irving’s criticisms of LeBron. After that, he said “There is no time to figure out how to save someone’s feelings when ultimately you have to be selfish in figuring out what you want to do.” (0:40). So, yeah, that’s one of the more unusual First Take segments in a while. And this time around, it’s not because of Smith and Kellerman.